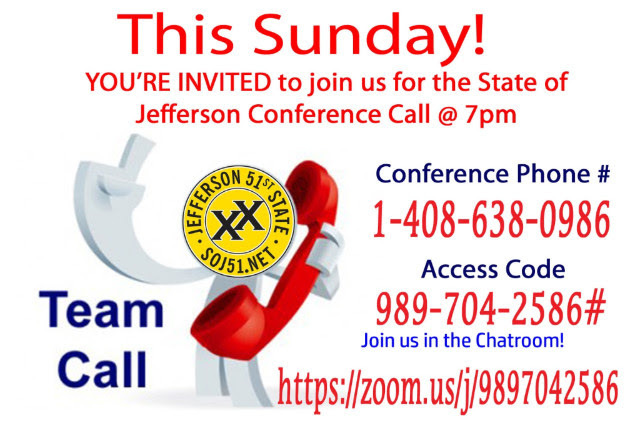 Getting out the vote for Yes on 6, Repeal the Gas Tax, will represent all we strive for in our battle for Jefferson and equal/fair representation. The fight to repeal the gas tax clearly illustrates the deceit and power that is the far left in the State Legislature, Governor Brown and Lt. Governor Gavin Newsom, also candidate for Governor. Once again California Attorney General Xavier Becerra has misled voters with his writing of the language on Proposition 6. Some voters think that if they vote Yes on 6, it means they are voting for the gas tax. 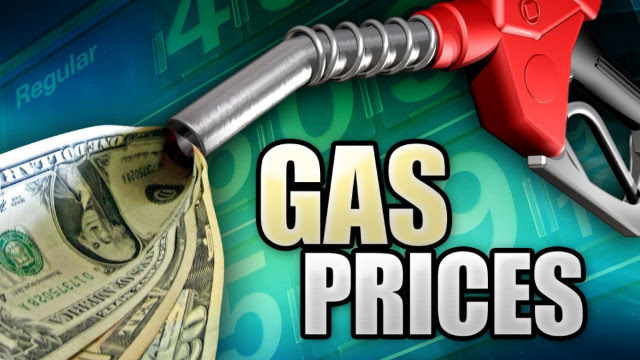 First of all, the gas tax and increase of vehicle registration fees were approved by the Progressives in the State Legislature and signed by Governor Brown last year. You never had an opportunity to vote on this. 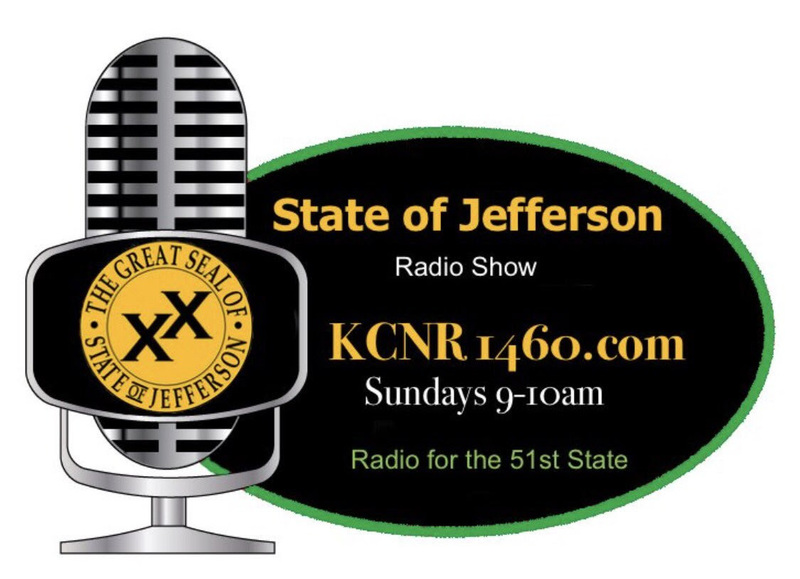 A Yes on 6, authored by Jon Coupal, Howard Jarvis Taxpayers Association, and John Cox, candidate for Governor, actually repeals the gas tax and vehicle registration fee increase. A Yes on 6, would also require voter approval for fuel and vehicle fee increases in the future and “defang” the state legislature to some extent. The transportation in the Road Repair and Accountability Act of 2017 was NOT in fact designated for road repair, but included movement-related expenditures such as studying transportation and promoting high speed-rail (Brown's $100 billion train), now estimated to cost each taxpayer $8,000. Add another almost $800 your family pays per year for increased gas taxes that could go for your family's Christmas. In the recent June 2018 Primary, Prop 69 was passed by the voters and was another incident of a falsely labeled voter measure by the Legislature Analysis Office. The true intent of the measure – to allow the Legislature to use the gasoline taxes for any purpose. A Yes on 6 will also cancel out Prop 69. Why are Brown's friends spending millions of dollars ($28 million) to defeat Yes on 6, because they are counting on voters (you) to be complacent or too dumb to really understand how you have been misled. And, if they are successful in the defeat of Yes on 6, they feel it will open the door to reintroduce bills for a cell phone tax, water tax and down the road, Proposition 13. 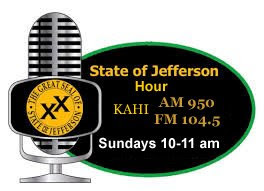 If you are a Jeffersonian, you are smart enough to know that this is not the first time that those in power in Sacramento have had their way with you. But I have to ask, is the threat of the failure of Proposition 6, and election of Gavin Newsom, Xavier Becerra, Alex Padilla enough to put a fire in your belly, to motivate you to actively join in the battle to take back California and most important, fight for the formation of the State of Jefferson? This effort is one in the same. After witnessing mob rule and the evil, despicable actions by the far left during the Judge Kavanaugh hearings, I feel our fight has now extended beyond the borders of California and Jefferson. I have always believed it all starts local, and just as Judge Kavanaugh stood his ground, so must all of us in the 23 Counties of Jefferson. If we can stand up and show up to Repeal the Gas Tax and defeat the election of Gavin Newsom, Xavier Becerra, Alex Padilla, we will be sending a huge message to not only the far left in California, but to all voters across this nation that will echo through to the 2020 Presidential election. 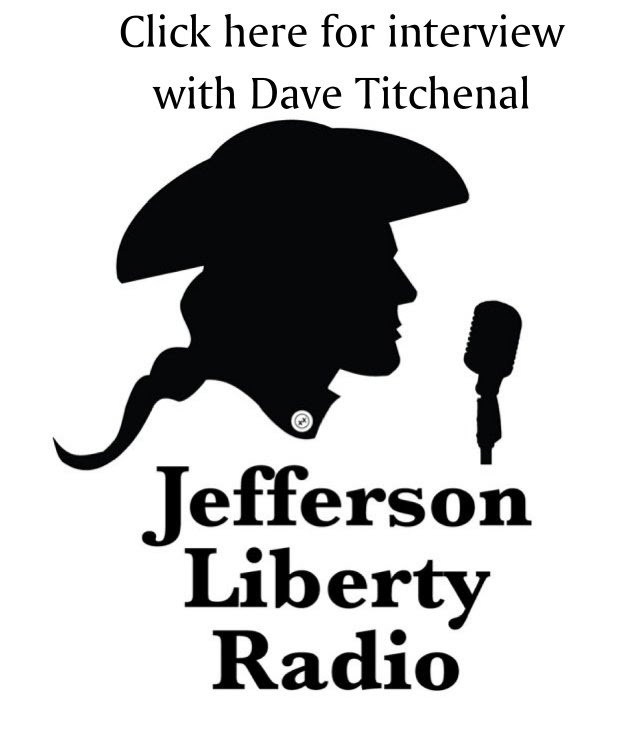 This and our expanded fight for Jefferson is just around the corner beginning in early 2019. So, I ask you. Over the next 25 days, are you willing to pull out all the stops and take to the streets, get on your phones, to take back our state and fight for all that Brett Kavanaugh stands for? We must support the conservative base and those who will stop voter fraud, return law and order, overturn bad laws, support the 2nd Amendment and put the health & safety of American Citizens before that of illegal aliens and criminals. I am asking you, no in fact, I am counting on you to visit your nearest county campaign headquarters or County Party and volunteer to make phone calls, precinct walk or coordinate sign rallies to not only Get Out the Vote, but to educate voters. Tell them about the threat of more taxes and about water rationing. Ask them if they remember the Fire Tax that will be returning with cap and trade, as will more hikes in gas prices. Pass out copies of Proposition recommendations while also handing out information about Jefferson. Through your involvement and education of others, you will assist in adding numbers to our movement, to fill the halls and steps during our next visit to the State Capitol. And, we will do so, not by mob rule, but by those representing all that is good in our Constitution and our nation of laws, seeking equal representation and a new state. California, Brown, Becerra, etc., have filed 44 lawsuits against the Trump administration at a cost of $9.2 million for the 2017-2018 fiscal year. This was up from $2.8 million the previous year. Lawsuits filed by California against the Trump administration include, preventing the federal government from ending citizenship protections for so called dreamers, to avert a rollback of its 2017 “sanctuary state” law, to prohibit the government from asking questions about immigration status on the 2020 Census and to defend the state's strong fuel efficiency standards for vehicles. The state has also led several high profile fights to halt Republican led efforts to undo Obamacare, and is challenging Trump directly on promises to build a U.S.-Mexico border wall, and to slow the arrival into the country of illegal immigrants seeking asylum. Although California is the 5th largest economy in the world, it has the highest poverty rate of all 50 states, and also ranks high in homelessness and near the bottom for education. It's Time for 51! “Success is not final, failure is not fatal. It is the courage to continue that counts." Calaveras SOJ Committee is selling SOJ ornaments! The ornaments are $10 each with four different styles to choose from. They are the perfect eye-catchers to put on your Christmas tree. The green one is plastic and the other 3 are made of wood. 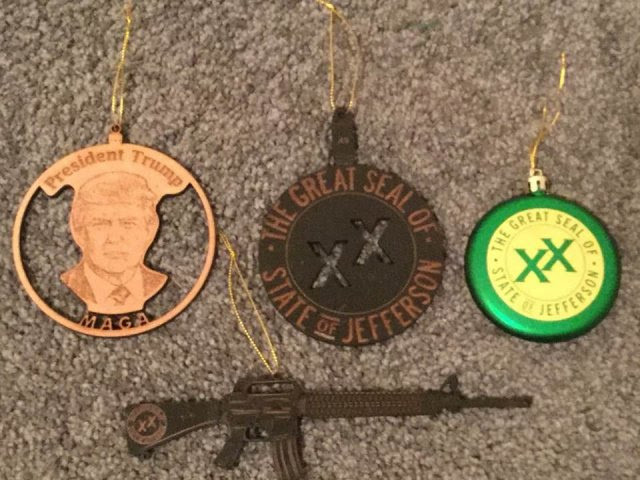 All proceeds from the ornaments will go to the legal fund. To order yours, email Leah Zoellner at leahsoj@hotmail.com. 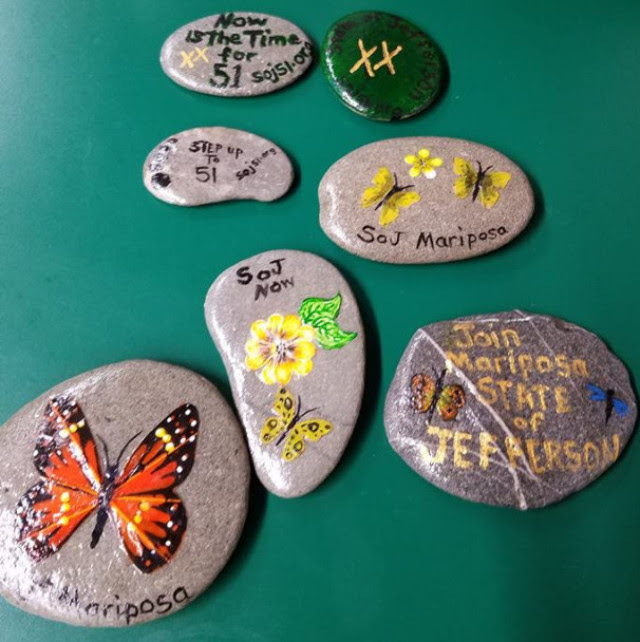 Rock painting has become a fun hobby and this a great way to spend time with family while creating them and spread the word about Jefferson as you place these colorful rocks around your town. 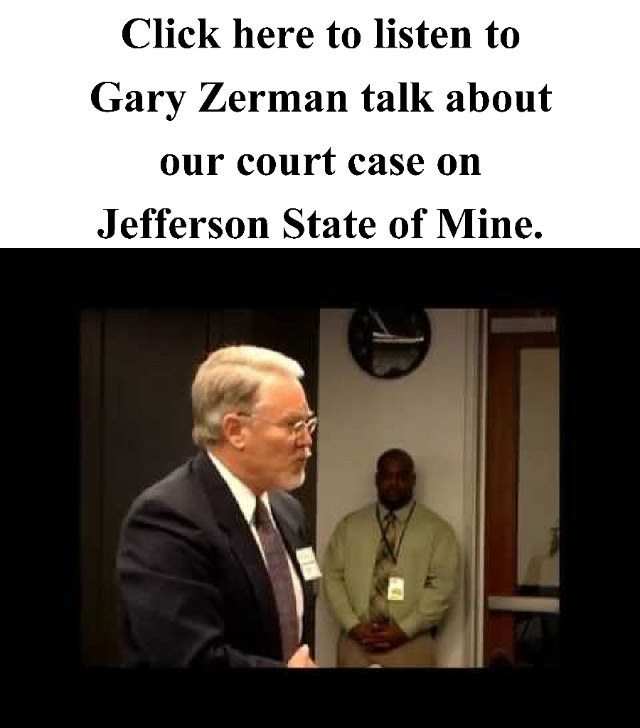 Idea suggested by Patty Smith (Tehama County).